Airlines are using sophisticated rostering systems to keep records of the flight and duty times for both Flight and Cabin crew. Aviation regulations require only pilots to log their flight experience in a logbook in order to maintain their licence and ratings. This requirement is not applicable for flight attendants and thus they never had a flight logbook. By searching the web for cabin crew logbooks you can rarely find any results. A flight logbook though is a lot more than complying with licencing regulations. By logging your flight experience you can see various flying statistics,like totals times, the aircraft types you have flown, aerodromes and cities you have visited, friends you have flown and most importantly recall memories form past flights. 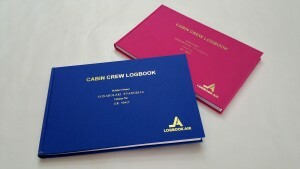 At LOGBOOKAIR we believe that Flight Attendants deserve a cabin crew logbook as pilots do. One of our electronic services is to use excel files from various airline rostering systems in order to automatically generate a pilot logbook in PDF ready to be printed and binded. We have modified the regulated logbook format to keep only the columns that are needed for logging the cabin crew flight experience.